The following article was published in Jan/Feb 2015 issue of Floral Notes newsletter. 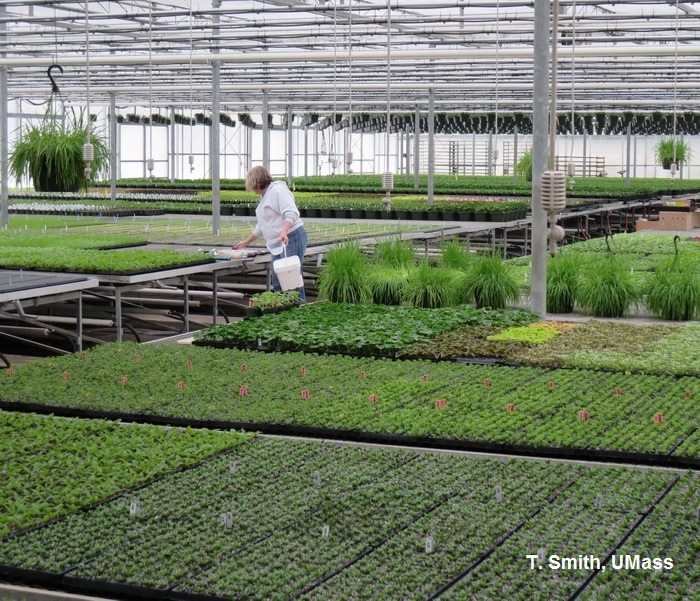 D&D Farms is a family owned wholesale greenhouse business in Stow, MA. The business consists of over 140,000 sq. ft of greenhouse growing area for pansies, perennials, annuals, mixed and flowering hanging baskets, 4” and 6” crops. D&D sows about half of their own seedlings, from pansies and perennials to the ever-growing selection of flowering annuals. They also grow vegetatively propagated plants. We have been using biological control to manage pests in our greenhouses for the past 5 years. We find that using biological control to manage pests is faster, easier and less costly than purchasing and using pesticides. Anyone can apply the beneficials and there is no re-entry interval needed like using pesticides. We also feel that our plants are healthier and of higher quality. Using beneficials is cleaner and healthier for customers and employees. Here are the biologicals we use and the pests they are used to manage. Nemasys (Steinernema feltiae) - Beneficial nematode used for fungus gnat larvae and also thrips pupae. Hypoaspis miles – Soil dwelling predatory mite used for fungus gnat larvae (will also eat thrips pupae and shore fly larvae). Atheta – Predatory rove beetle for shore fly and fungus gnat larvae. Atheta will also eat thrips pupae and other soil insects. Amblyseius cucumeris – Predatory mite used for thrips. ABS (Amblyseius-Breeding-System) is available in sachets or loose in a tube. It contains a food source (prey mites) for the predatory mite, allowing reproduction inside the sachets. This allows a continuous release over several weeks. BotaniGard (Beauveria bassiana) is an insect-killing fungus used to manage thrips, whiteflies, aphids and mealybugs. It works best with high relative humidity and thorough coverage. Banker plants are used to manage green peach and melon aphids. Banker plants are grass plants such as barley, wheat or oats that are used to rear, release and sustain aphid parasites before aphids appear in the crop. Here’s a summary of how they are grown and used. Barley plants (or wheat or oats) are purchased with bird cherry oat aphids on them. The infested plants are planted in hanging baskets. The bird cherry oat aphids attack only monocotyledons. Once the bird cherry oat aphids are established, we sprinkle Aphidius colemani and Aphidus matricariae (two types of parasite wasps) on the bird cherry oat aphids. Aphidius parasitizes and then emerges from the bird cherry aphids. Once parasitized bird cherry aphid mummies are observed, we place the banker plants throughout the greenhouse where emerging Aphidius will parasitize green peach and melon aphids on the crop. Orius - Predatory plant bug for thrips. Encarsia formosa (for greenhouse whitefly) and Eretmocerus eremicus (for silverleaf whitefly) - Two different whitefly parasitoids used as needed. Here is our schedule for using biologicals. It may be helpful if you are just beginning to use biocontrols to manage pests in your greenhouses. Sanitation is important for successful pest management. At the end of each growing season, before closing the greenhouses for the year, we thoroughly clean our greenhouses. We pull weeds and clean up any plant debris and algae from the floors and sweep the floors thoroughly. This helps to prevent carrying over pests to new crops. We order beneficial nematodes, Nemasys (Steinernema feltiae) a week before opening a greenhouse or bay. If plant material is expected to arrive, we also order, Hypoaspis miles (predatory mite), Atheta (rove beetle) and ABS (Amblyseius-Breeding-System) (Amblyseius cucumeris- predatory mite). We order A. cucumeris in sachets and one tube of loose (20K). At this time we also order banker plants because it will take 3 weeks or more to rear parasites for managing aphids. Note: When biologicals arrive, it is important to open up the package immediately and inspect them for quality. Here are some general guidelines when a package is received: Open the package, look for condensation or fermenting smell and temperature of contents; look for movement, if shipped as pupae or mummies, record the number of emerging adults; and keep good records. Take notes of species name, packaging type/size, date received, company batch number, date tested, method used, number of samples, number of biocontrol agents counted and any other observations on the appearance and performance of the product. If a potential problem is detected, contact the supplier. Upon arrival, we refrigerate the Nemasy and write the arrival dates on the outside of all materials. We use the biologicals as soon as possible but sometimes we store extra for a short period. Check with your supplier for specific holding temperatures and conditions for specific biocontrol agents. Most biologicals should not be refrigerated. Dating helps us to make sure we use the oldest first. When banker plants arrive we plant them into 10” hanging baskets or pots. We divide each plant in half and plant into two hangers. We plant in the middle of each pot and sow barley seed around the outside edge of the banker plant. While wheat and barley are best, oats can also be used. This provides a continuous supply of new plants for the aphids. We keep these plants warm to continue to breed more aphids on them. We grow banker plants in the basement of our house by a window. Our goal at this time is to raise a good population of bird cherry oat aphids on the plants to eventually have a large population of parasites. If grown in the greenhouse, the plants would need to be grown in a cage to protect the bird cherry oat aphids from being parasitized by existing Aphidius. When plant material arrives, we apply the Nemasys (parasitic nematodes). Nemasys is best applied when it stays wet on the plant and doesn’t dry too quickly. While there are slightly different adaptations for applying nematodes, this is what we do. We usually apply them late in the afternoon or on a cloudy day. We mix 1 package (250 million) Nemasy with 3 gallons in a 5 gallon pail of cool water and nothing else. We apply with a dosatron set at 1 to 100 ppm (to deliver 100 gallons final solution). We remove the filter to prevent clogging. Do not apply with hydraulic pump because this will crush the nematodes. The hose nozzle should have large openings so the nematodes can move freely through the opening and not clog it. We wet the plant leaves and soil as much as possible during application. We also drench the floors of the greenhouse with the solution of nematodes. If we have plant material that is unrooted, we stick them into trays, then, drench the floors and water in the unrooted stock with Nemasy. If we have rooted plant material we apply Nemasys to the floors and water it into the trays. If we have pots filled with media and will be transplanting into them the next day or two, we will also water pots with the Nemasys. Within the first couple of days of the arrival of our first plant stock we distribute the loose Amblyseius cucumeris (ABA) by gently sprinkling (broadcast) them over the unrooted and rooted plant trays. We take handfuls and gently throw over the benches while walking along. We use the broadcast method because we are always moving things around. We also place a small pile (about a teaspoon) of loose ABA in the middle of each plug tray. Some growers may prefer to use sachet packets placed between the trays in place of broadcasting loose ABA if they do not move trays around. On the same day we also broadcast Hypoaspis miles and Atheta over the trays. We also broadcast these when we open new bays or open greenhouses for the first time during the season. As new plant material arrives we follow the same procedure as it is introduced into our greenhouses. We do this about once a week only on new material. If we move plants into another greenhouse or bay, we try to at least drench the floors with Nemasys before moving in the plant material. We also apply Nemasys once a week on a regular schedule. We watch the weather and try to apply the nematodes on cloudy days. We do not apply Nemasys to our banker plants. Once a week or every ten days we also use BotaniGard on all plant material except the banker plants. We use the wettable powder formulation. We order and receive Aphidius colemani. We order both Aphidius colemani (500) and Matricariae- System (500) (Aphidius matricariae). Aphidius matricariae is a parasitic wasp similar to A. colemani but is more effective at cooler temperatures and is effective against tobacco aphid. Note: Aphidius colemani is not used to parasitize larger aphids such as the foxglove aphid and potato aphid. If foxglove or potato aphids are your predominant species, another option is to use the predatory midge Aphidoletes aphidimyza for release onto your banker plants. If using predatory midges, placing the pots in trays with moist sand will help provide pupation sites for the predatory midges. (The predatory midges pupate in the soil). Once we receive A. colemani and A. matricariae we move the banker plants (except one) into the greenhouse, then, we group them together and sprinkle the Aphidius on top of the banker plants. It takes about one to two weeks for the Aphidius to breed and parasitize the bird cherry oat aphids. We save one plant that we will use to start new banker plants. Once we see parasitized bird cherry oat aphids (mummies) on the banker plants, we hang the bankers where they will remain for the season. We make sure to add these on to the irrigation drip lines, so they get watered with other hangers. If any part of the original plant dies off, for example in the middle, or if there is a lot of dead grass in hangers, we remove only the dead part of the plant and reseed with barley again in the middle. The Aphidius will continue to breed. From these original banker plants, we continue to make our own banker plants. We sow barley or oat seeds in the middle of several hanging baskets and place the hangers next to the saved banker plant that is infested with the bird cherry oat aphids. Next we cut some of the foliage (grass) off of the “saved” banker plant containing the cherry bird oat aphids and place the infested grass over the top of dirt in new pots. When the barley germinates and grows, the bird cherry aphids will infest the new sprouts. It takes about two weeks to make a new batch of banker plants. We add more barley or oat seed around the outside of each hanger before moving the banker plants into the greenhouse. When moving the second batch of plants with the bird cherry oat aphids into the greenhouse we make sure that we place them near a banker plant with parasitized aphid mummies. Or, we order more Aphidius colemani and add to them to the new bankers grouped together. We wait until we see mummies (usually takes about a week) before hanging them in their final spot in the greenhouse. We continue growing banker plants until we have one banker plant per greenhouse or bay of greenhouse. We continue this process for the spring growing season. It is now three weeks since we received our plugs (various crops) and we are going to transplant them into their final pot or hanging basket. When ordering our ABS (Amblyseius cucumeris ) system, we order enough to use one sachet per hanging basket and enough loose (tube) to broadcast. We also broadcast one more application of Atheta and Hypoaspis miles at this time. The sachets placed in each hanging basket lasts about 2 months or so. After transplanting plugs into hanging baskets we apply Nemasys (within a couple of days or the same day that we transplant). We continue to drench these at least once a week making sure to get the foliage wet. Within a couple of days after transplanting we also broadcast the loose ABS over the tops of each hanging basket and place a sachet into the middle of each. We let the plants grow a little on the bench before hanging them into place. When transplanting into pots of any size (4” to 6”) we place sachets between pot trays or we place one pile (about 1 teaspoon) in one pot per tray (6, 8, 10 or 15 count tray). If these same plants are grown for longer than 3 months then ABS can continue to be broadcast over the tops or piles can be renewed or new sachets can be used. When we transplant into larger pots such as window boxes, we usually broadcast with ABS then wait until the plants have grown some and when we trim the plants, we place the sachets into these containers also. We use sticky cards to monitor flying insects such as thrips, whiteflies, adult fungus gnats and shore flies in our greenhouses. Yellow cards attract most insects, however, Aphidius colemani are really attracted to them, so we try to place the cards away from the banker plants. Sticky cards work great for detecting population of Aphidius colemani. If we need to place cards near banker plants, for example to detect thrips, we use the blue sticky cards. Remember to replace cards when needed with fresh cards. We monitor our sticky cards about once a week, on the same day each week. If we notice a hot spot with thrips and it is early in the season we order the predatory plant bug Insidiosus system 500 (Orius) and apply these directly to the area that has the hot spot. We monitor aphids by inspecting the plants and looking for signs of feeding such as curled new growth, honeydew or white cast skins. For hot spots of aphids late in the season we have used lace wing (Chrysopa-System 1K larvae). We sprinkle them onto the plants that are most infested. It has been our experience that they consume large numbers of aphids. However, we only use them as a last resort because they are general predators and will eat other beneficials. If we see even one whitefly on a sticky card we order Eretmix system 100-5000 cards. Eretmix contains two whitefly parasitoids; Encarsia formosa (for greenhouse whitefly) and Eretmocerus eremicus (for silverleaf whitefly) mixed together to manage both types of whiteflies. These are sold 50 cards to a box. Each card contains parasitized whitefly pupae. The wasps emerge from the pupae, search and parasitize the whiteflies in the greenhouse. We place these in hot spots at the rate of one to three per bay or small greenhouse. We do this for about three to four weeks until we no longer find whitefly on sticky cards. Note that whitefly parasites work best if the whitefly species can be identified and the specific parasite is used for that species. These cards are most effective if placed in shade under foliage. We have also used them on greenhouse tomatoes. On our greenhouse tomatoes, we distribute them weekly until we are finished harvesting. We place cards containing parasitic wasps low on the plants the first week then near the top of the plant the following week and alternate each week until harvest is complete. We advise our retail customers to follow the same procedure that we use when bringing new plants into a greenhouse. Plan to use biologicals when opening a greenhouse for the season and as new plant material arrives. If plants are to be held for two to three weeks, we suggest they apply beneficial nematodes to all plant material and broadcast predatory mites (Hypoaspis miles and Amblyseius cucumeris) as soon as plants are put in the greenhouse. If plant material is expected to be in the greenhouse longer than two to three weeks, then we suggest using Amblyseius cucumeris sachets. If growing vegetables to fruit in a greenhouse these same biological agents will work. Exceptions are that Nemasy (parasitic nematodes) do not work on tomato plants for thrips because of the hairs on the tomato plants limits their mobility. Also Amblyseius (ABS) also does not work on tomato plants for the same reason. Banker plants can be used for aphids with your tomato crop and lace wings can be used for hot spots of aphids. It is best to identify the species of whitefly and use the parasitic wasp for that particular species.